Here are a few of our favorite bookish subscription boxes. The boxes listed are boxes that we either subscribe to ourselves or have been sent boxes for review and found them worth recommending. So below you will find boxes that we've personally experienced and loved. EACH OF THESE BOXES HAS STELLAR DEALS THIS WEEKEND! Please check each description below for discount codes and the linked websites for the Black Friday and Cyber Monday deals! Young Adult crate is for ages 14+ and includes 1 new release hardback book and 2-4 bookish items. What I love about LitJoy is that so far they have chosen great new release books that haven't been very hyped or well-known. This means I get a great book that normally wouldn't be on my radar, since most people focus on highly hyped and widely seen books. I also love how much thought and care go into the items included. They really enhance the reading experience, as all the items are related to the book or themes in the book. Its fun to be reading a book and understand why an item was included, or to have a piece of that story after I close the book. - Month-to-month plans are $29.99 (plus shipping) and you are billed each month. - 3-Month plans are discounted to $28.99 per month (plus shipping) and you prepay for the three months. - 6-Month plans are discounted to $27.99 per month (plus shipping) and you prepay for the six months. What I love about this box is that each quarter the box is curated by an author! The box comes with the curating author's latest release which has been tabbed and annotated by the author, two additional books that the author adores, and a few fun items. The annotated copy I last received was such a treasure. It definitely enhanced the reading experience and made the story and the writing of the story so much more of a personal thing for me. I loved reading the letter from the author and seeing why she chose the other two books and the items for the box. Really, it was such a fun box. SPECIAL CYBER MONDAY DEAL: Be one of the first 200 people to purchase any Literary box gift subscription and receive a free exclusive, annotated book with your purchase! For Literary Fiction gift subscriptions, you will receive an annotated copy of "Only Love Can Break Your Heart" by Ed Tarkington For Literary YA gift subscriptions, you will receive an annotated copy of "Willful Machines" by Tim Floreen. Send the book to yourself or directly to the recipient in time for the holidays. Just enter code: BOOKGIFT at checkout and we'll take care of the rest! The first complete box will ship in January 2017. Stay tuned to find out who the author curator will be! 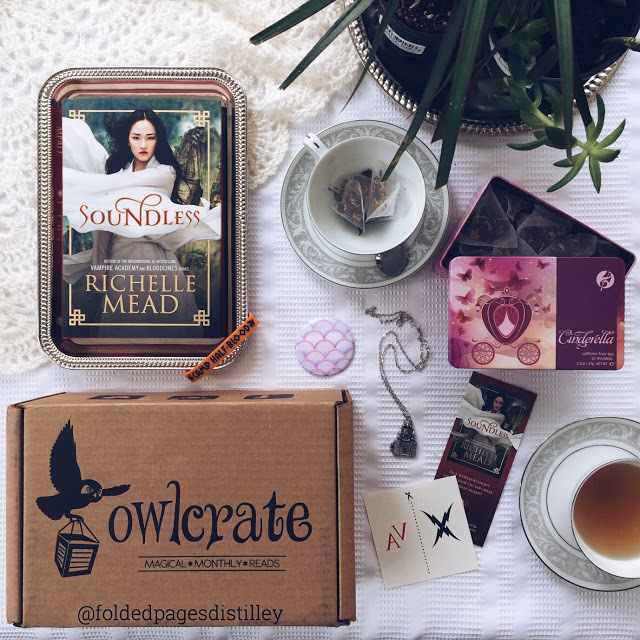 OwlCrate is a Young Adult book crate. Each box contains one brand new hardcover Young Adult novel, as well as 3-5 other bookish keepsakes to help set the mood for your literary adventure. Every box will be built with a super fun and creative theme in mind, and will also include special goodies right from the author! Uppercase is another Young Adult subscription which comes with a brand-new YA book, author signature, and a few other exclusive bookish items. What I love best about Uppercase is their book club. Each month subscribers receive a note with keywords and page numbers to use online in a book club forum. I think it's one of the coolest and best online book club models and really sets this box a part. If you're looking for a more interactive experience with minimal items, this is a great pick. I also love that they offer a book-only option. I've noticed that Uppercase generally comes with a notepad and print (among other things that vary) and it's nice to know what to expect. Hello Book Lover is a monthly subscription box curated for “the modern woman.” Each box contains a book and 2-3 extra goodies, and subscribers have the opportunity to pick between two books or be surprised. Book choices are sent out on the 15th of every month via email and boxes are shipped the first week of each month. .
From their site on how they choose books: "Regarding how we choose our books: We curate our books specifically for the woman who loves to read but doesn't necessarily have the time to keep up with new releases and popular books. We assume that even if our books are older releases many of our subscribers will not have gotten around to reading them yet! We try to choose one book that was very popular for our subscribers who may have heard of the book, but never got around to reading it when it was new. Conversely, the other book option is often lesser known for our subscribers who keep up with reading more popular releases and have probably already read the more well-known choice. The two books also fit with our theme each month!” . (The items I received were the honey and dipper, three tea packets, and chapstick and bath salts along with the book) The items were simple, but I used every single one and was truly pleased with them. Once Upon a Book Club box is an immersive experience in Women’s Lit. Each month you can expect to receive a newly released Women Literature book (hardback or paperback) along with 2-4 corresponding gifts to match the novel. Each gift is individually wrapped with a page number attached to it. As you read the novel you will come to pages with sticky notes and numbers letting you know it’s time to open the gift that corresponds to that page. The gifts relate directly to the story and it makes an amazing experience to be reading about an item in the book and suddenly holding the item in your hand. Each month Once Upon a Book Club Box also leads an online discussion about the book and encourages you to get online an interact with your fellow readers and often they often have live discussions with the book authors that you can participate in. I’m not huge into women’s literature as a genre but I could not believe how fun this experience was and it doesn’t seem to matter how many books I have in my To Be Read pile the second my Once Upon a Book Club box lands on my door I dive into the book because I cannon resist the allure of wrapped gifts. :) The books have been fantastic and the experience is just something else all together. I really feel like it pulls you into the story in a very unique and fantastic way and I cannot recommend them highly enough. Plus now through January you can use the code “NOVELPAIRING” during check out to receive 10% off your first box. 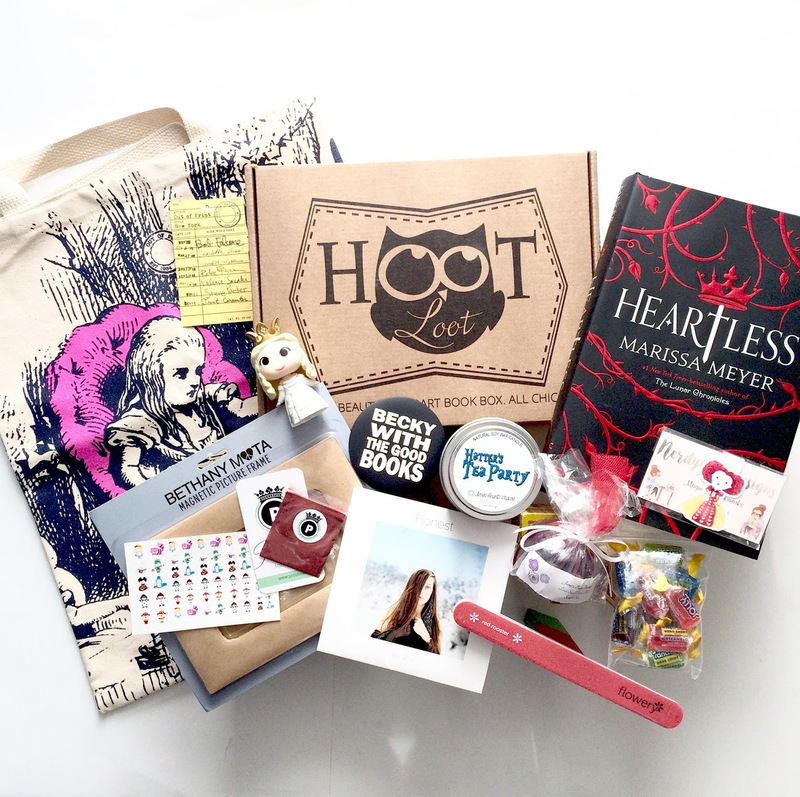 HootLoot Box is a Young Adult book box/ beauty box. Each box contains a newly released Young Adult novel as well as 1-2 premium bookish items, 1-2 smaller bookish items, and beauty samples. All of the items relate back to the theme of the book. Also each month one lucky subscriber gets bonus items in their box, November’s bonus box included an “Out of Print” tote and a CD. I was really impressed with the November launch box. It was packed full of high quality beauty and bookish items related to “Alice in Wonderland” and the book was one that I have been dying to get my hands on. You can receive 10% off any new orders from now until December 31st using the code “NOVELPAIRING10” during check out. Decembers theme is "To The Stars". HootLoot has a variety of purchasing options and it is not an ongoing subscription, you sign up each month you want one. Parnassus is for the book collector in your life. This is a Young Adult box and it only comes with a book. But not just any book. It's a first edition and is always physically signed by the author. No bookplates here! If you don't want the extra items, and you want a true collectors item, this is a perfect box for that. Two types of subscriptions are available. Subscribers can choose from a prepaid 3, 6, or 12 month plan, or choose to be billed on a monthly basis. Monthly subscribers are billed for only the cost of the book (typically between $17 and $19), plus $6 shipping. Prepaid plans are available for $75 for 3 months; $150 for 6 months; or $300 for a full year of books. Sales tax and shipping are built into the cost of prepaid plans. When you sign up for the New Release Fantasy and Sci-Fi Books Plan, you will receive a carefully selected new release Sci-Fi or Fantasy book and 3 or more bookish item. When you sign up for the All Fantasy Plan Young Adult plan you will receive a Fantasy book and 2 bookish items. I received two of the Fantasy boxes and was especially pleased with the book selection and the items that were so closely tied to the book. My Book Box is a favorite of mine because you can share it with someone if you want. Each box comes with two books and you get to choose which of their genres you would like. The six genres are: Children 3-7, Children 8-12, Young Adult, Non-Fiction, Womens Fiction, and Mystery. I selected to have a "Mommy and Me" type of box, and picked a book for myself and one for my daughter. We had a lot of fun opening and sharing these boxes instead of buying one for each of us. MyBookBox offers monthly, 3-month and 6-month renewals starting at just $39.95/month plus shipping. Fairy Loot is a Young Adult fantasy fiction box based in London which includes one new release fantasy fiction and 3-5 themed items. I have seen these boxes progressively get better and better as they grow. One of the fun things about Fairy Loot is the reading buddy code included in each box. Each box contains a unique code shared by two people. Post a photo of your box using your coded hashtag and find your reading buddy. The two of you can connect and talk about the book as you read. Like LitJoy, Bookly Box also runs on a book for book model. For every box purchased a book will be donated to underserved communities in less fortunate countries. Bookly Box also offers an online book club community exclusive to subscribers called BookBuddy. Each box comes with a new book from the genre of your choice, a bookmark, some tea, book tabs, and "two different items every month that will make all the difference in your experience, a comprehensive report of where your donation went to and how it will make a difference, an entire podcast dedicated to every book that you receive where the moderators of your genre group will discuss that book and sometimes even the author, immediate access to our online book club community, BooklyBuddy, and a heartfelt thank you." Use Code: FOLDEDPAGES5 for an 8% recurring discount. Currently on sale for $26.99 plus shipping. Subscribers get 5-7 fandom related exclusively designed items such as, prints, notebooks, stickers, buttons and bookmarks. These boxes are amazing and fun and I haven't yet been disappointed in the items. Each Book Box includes a different style phone case along with 2-3 small bookish gifts such as a necklace, notepad bookmark etc. to match the theme of the book phone case! You choose your phone size, and from one of the three themed boxes: Manly Man, Girly Girl, and Anything and Everything. The items that come in these boxes never cease to amaze me. It's always really great stuff, PLUS a phone case that is bookish themed. Appraising Pages is a literary and pop culture inspired box that comes with a specially designed t-shirt and 3-4 related items. I absolutely love the designs and the shirts that have come in these boxes and even though the other items are always great, I'm really in it for the shirt.